We had already sampled Southern Oregon Brewing's La Freaque, which is their version of the brew, and it was fascinating to see how the various breweries' takes on the same recipe varied. 999 Beers shared its review of Ninkasi's brew, which we did not get to try, and BS Brewing likely had a few words to say on the project. Neither seemed overly impressed, but we liked the collaboration beer so much that we ended up taking home a growler of Oakshire's version. It could be that the beer has mellowed out quite a bit in the month since its initial release. And speaking of Oakshire Brewing, I had been fortunate enough to meet Jeff Althouse, co-founder, during one of his trips through Southern Oregon. 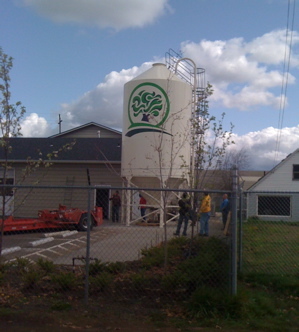 He invited us to stop by the brewery and watch the installation of their new grain silo. It was pretty impressive. We sampled a good deal of their beer, and of course had to take some home. I have been a big fan of their Hippie Town Brown since it was first released as Ill Tempered Gnome last Fall, so was happy to see that it was still around. Likewise, their new Cascadian Dark Ale, O'Dark:30, is bound to a really big hit. I am very excited about Oakshire, and definitely think that they are a brewery to watch. It's great to see that kind of enthusiasm for brewing and experimentation in Oregon, and I am really looking forward to some of the beer projects we saw while being shown around their brewery and warehouse. There were two breweries we really wanted to visit but didn't get to see on this trip. The first is Wakonda Brewing in Florence, and the second is the Brewer's Union Local 180 in Oakridge. The latter supposedly brews cask-conditioned real ales, which I would dearly love to sample. It will have to wait until next time! This page contains a single entry by Erik Arneson published on March 27, 2010 9:19 AM. 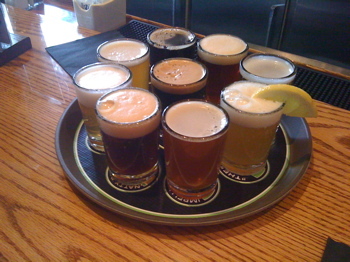 The Desirability of Extreme Beers was the previous entry in this blog. Interview with a Chicken Farmer is the next entry in this blog.